The Kaw Nation Water Quality Monitoring Program was designed to provide continued support for the Tribe’s water pollution program. The objective of the program is to continue the sampling of waters to assess the surface water quality on Tribal lands, for the purpose of determining water quality impairments over time, and to develop Tribal Water Quality Standards. Obtaining water quality data will help to determine whether: 1) the need regarding the quality of the water occurring on the nations jurisdictional area are being met, 2) note any changes in the quality and or condition of the Nation’s water, and 3) understand and define the function and health of the streams’ and lake’s ecosystem. 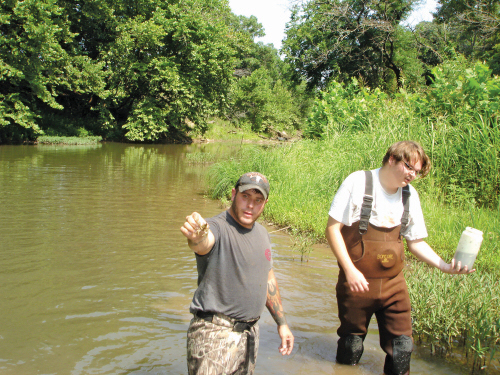 KNED also works closely with the Oklahoma Department of Wildlife Conservation, the Oklahoma Department of Environmental Quality, and Oklahoma State University to assess the water quality from a biological perspective by studying fish tissue and performing macro-invertebrate studies. The following sections will list the different areas of the water quality program. The Kaw Nation Environmental Department’s (KNED) main activity is monthly water quality sampling of Kaw Lake and associated creeks and rivers. The effort is focused on protecting this valuable natural resource. Kaw Lake is eutrophic, which means it has high nutrient levels. Hardness and alkalinity are high due to the nature of the geology surrounding Kaw Lake. Pesticides have been found in Kaw Lake and the surrounding streams. 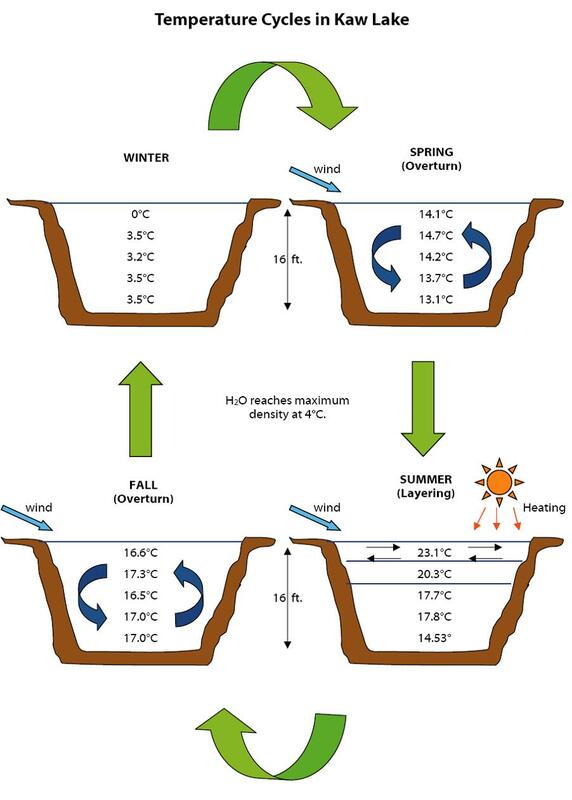 KNED has observed the annual lake turnover and developed the following diagram to represent this occurrence. KNED has two sites on Ponca lake and seven sites on Kaw Lake. We only sample three or four of them each month. 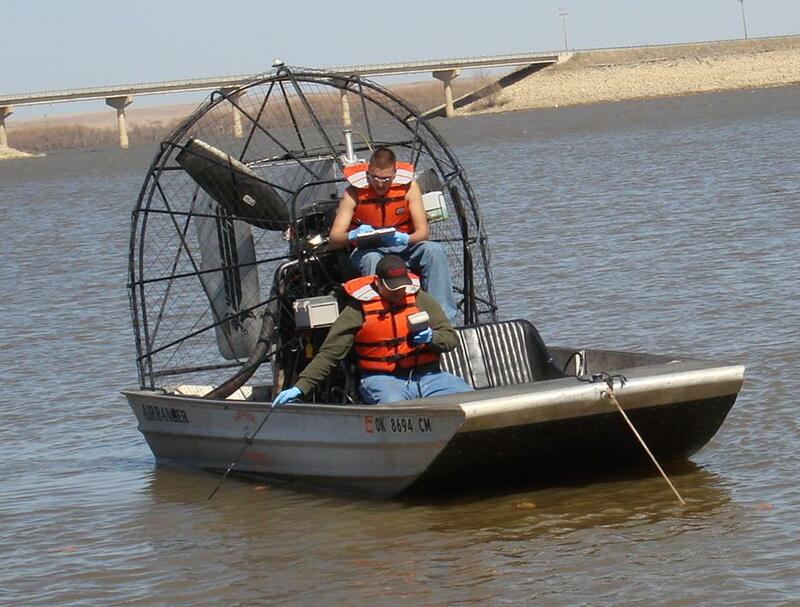 KNED has an air boat, which is pictured above, to assist them in sampling. 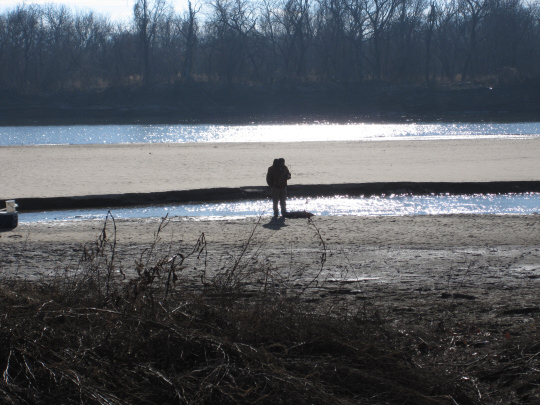 In addition to our lake sites, we sample three spots on the Arkansas River which feeds Kaw Lake. 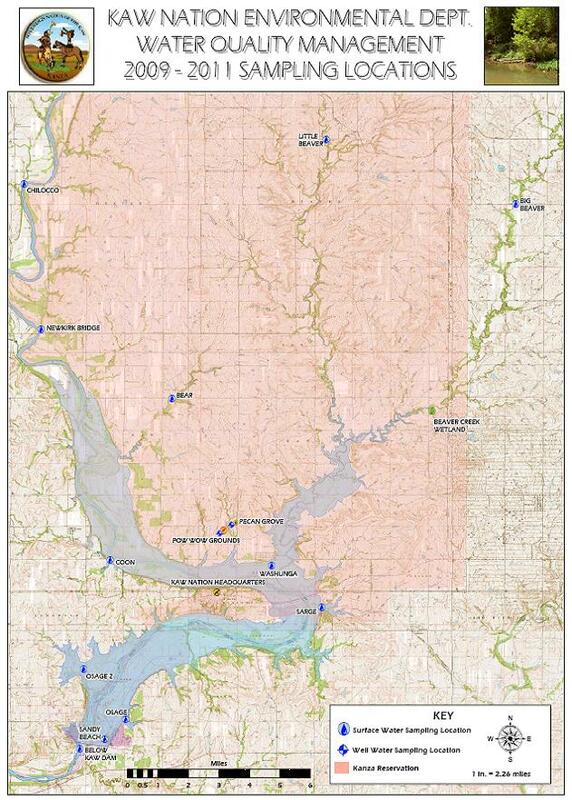 KNED have two sites above the lake and one site below the lake which are listed on our sampling site map above. We sample these areas one a month also. This is a picture of our sampling site and the Chilocco Creek influence with the Arkansas River. KNED also sample three creeks that feed into Kaw Lake: Big Beaver, Little Beaver, and Bear Creek. Every summer we visit our creek sites and conduct macroinvertebrate sampling. Also during the summer we conduct fish sampling from the lake and the creeks. Each year we also take soil samples from the bottom of Kaw Lake and Ponca Lake. Tribal Members: If you wish to request Tribal services (mold, water, radon, soil testing, etc. 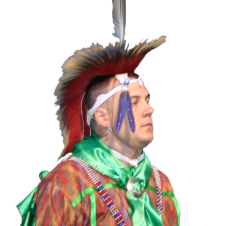 ), please feel free to complete the Tribal Service Request Form. We'll be happy to discuss these requests with you to further educate ourselves with your problem in order to find the best solution. Kaw Enterprises: If you wish to schedule an Environmental, Underground Storage Tank or Food Inspection please complete the Tribal Service Request form below and indicate which type of inspection you are requesting. The KNED will contact you with an appointment time. Schools and other Educational Institutions: If you wish to schedule a study tour and/or are requesting educational supplies, please complete the Tribal Service Request form. The KNED will contact you at our earliest convenience. Please feel free to complete our Environmental Questionnaire. Your feedback can improve the quality of services offered by the KNED and could increase the likelihood of federal funding for specific projects. If you are an enrolled Tribal member, your participation is strongly encouraged.